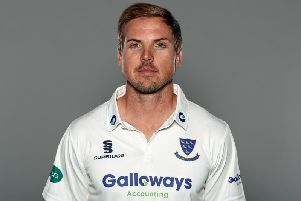 The South African showed what Sussex missed when he was out injured for most of last season as his 101 not out gave them a six-wicket victory, which went a long way to banishing memories of their opening match loss to Leicestershire. The batsman said: "To get a hundred in the last innings on the last day, I'm very proud of it. It's a great win for us. I was out injured for a lot of last season and now to come back to get the win is very sweet. "The Leicestershire game was disappointing. We let ourselves down there. That's why this win means a lot to us just to get that first win of the season. It's crucial for any team. "Luke Wells saved up from 70-7 to get us back to only 22 behind - that was an unbelievable innings. It was a cold four days, but we knew that. To go through it and get a win was good for us and team morale. "We knew if we got a partnership going this morning to get the runs to win below fifty we would see the body language in the field go down, then we could capitalise. The wicket was okay when the ball was softer. You just had to hang in there and get the runs." Durham lead high performance coach James Franklin added: "We've had our chances there's no two ways about it. The game against Derbyshire we had them five down in the first session, and here we had Sussex 70-7. To end up on the losing side in both of those games is disappointing. The guys are hurting about that. We've had batting collapses as well, which is not great fun either. We've got plenty of scope to improve. "It has been evident in our four innings this season that when we lose one, we can lose two or three quite quickly. Whether or not that is a little bit of reminiscence of what has been happening the last couple of years and we're suffering a hangover of that. I'm not too sure. What we can do now is reflect on how we want to go about our Championship cricket. "We've got a nice break now into our one-day cricket. We've got a whole campaign there to quickly get our minds focused on in the next couple of days. 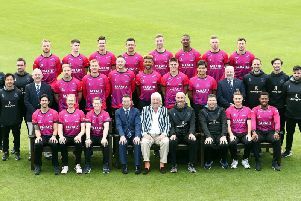 When we get back to Championship cricket in May, we've got to be very clear on what we're about because these first two games aren't good enough."